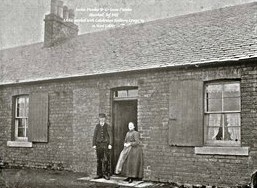 Muirhall Rows, or Merchiston Buildings, Agnes Dundas & son Archie. Meg Stenhouse. All rights reserved. My Great Grandad Robert Dundas was born in Samsonagh, Devenish, Co Fermanagh, and came to Glasgow in 1867 with his father. An older brother was already in Glasgow. His father Charles married a Catherine Bowie in 1868, and in 1873 Robert married Catherine (Kate's) younger sister Agnes. The Bowies were from South Uist and both women were Gaelic speakers. Robert, Agnes and their eldest two children came Muirhall in 1877. Robert was a cooper to trade and came to work at Addiewell Oil Works. They lived in No 21, then No 2, where the rest of their family were all born. Sometime before 1911 they moved to No 4 where Robert remained until his death in 1929. 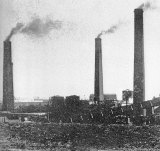 Their sons Charles, Donald, Robert, William and Archie all worked at some time in the Oil Works, though Archie eventually worked with the Caledonian Railway before emigrating to Australia in 1911. Archie joined the 25th Australian Infantry and was killed in action in WW1 - his name is on the War Memorial at the Library, West Calder. Wullie too joined the AIF, the 47th, and was severely wounded, spending the rest of his life at Erskine Hospital for the War Wounded until his death in 1969. Son Robert (my Grandfather) stayed in Addiewell and West Calder area, after his marriage, firstly in Tennants March, then Dickson Street. After his father's death in 1929 he had the tenancy of 4 Muirhall, where he'd been born and raised, then when Muirhall was demolished, they moved to 110 Mooreland Gardens until his death in 1952. Grannie then moved to 113 Mooreland Gardens until her death in 1966. I have many happy memories of staying with Grannie every chance I got throughout my childhood. There are no Dundas family left in the district. Two of my mother's brothers went to Buckinghamshire to work on the railways Of the other two, one went to Torphichen and one to Armadale, where I still have cousins, though the largest contingent is in Bucks. Of my Mum's two sisters, one went to America and one to Canada, so only my mother remained in the district. Strangely though my sister now lives in Addiewell, so we still have ties in the area. This page was added by Meg Stenhouse on 23/07/2012. Thanks for this Meg, it's wonderfully detailed. By an amazing coincidence, I find that I am descended from Robert's father Charles too, my branch of the family comes from his second marriage in Glasgow in 1868. Those Dundases stayed in Glasgow and its environs until my father moved to West Lothian for work in 1980. That means that I was brought up less than 5 miles away from Addiewell completely unaware that the local Dundases were anything to do with our family. Thank you. I'm happy to share any details that I can with you from what I know.